Sold by NoCry Tools & Gear and ships from Amazon Fulfillment. NoCry Cut Resistant Gloves - Ambidextrous, Food Grade, High Performance Level 5 Protection. Size Large, Free Ebook Included! 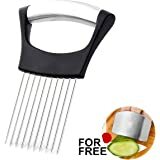 The OXO Good Grips V-Blade Mandoline Slicer has four blades and an easy-to-use slice thickness adjuster for professional-grade straight slices, crinkle cuts, French fries, julienne cuts and more. Easily slice firm vegetables like potatoes and soft fruits like tomatoes. 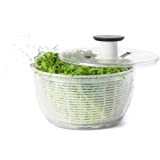 Choose from straight or wavy blades for straight or crinkle cuts or the small or large julienne blades for shredding vegetables or making fries. 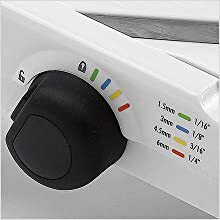 Simply turn the knob to choose between 1.5mm, 3mm, 4.5mm and 6mm slice thicknesses. 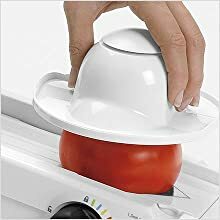 The food holder securely holds food and protects fingers while slicing. The textured runway keeps food from sticking while slicing and the non-slip feet keep the Mandoline steady. All four blades store on board, feet fold, and Mandoline locks closed for safe storage. 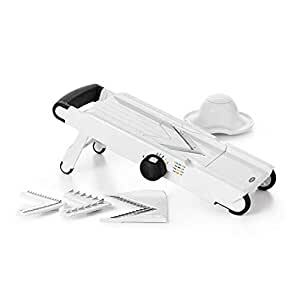 I bought a KitchenAid mandoline slicer that required me to hold it and slice (with no protective fruit/veggie cover) and I nearly sliced my finger off. It was a chaotic mess to use. I immediately packaged that up and returned it to the store. 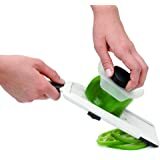 My next slicer I bought was the OXO Good Grips V-Blade. 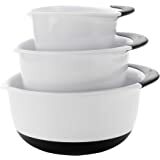 I have a very small kitchen with very limited storage space, so i was worried how much space this would take up in my kitchen drawers. Fortunately, it fits great. 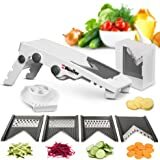 It's compact, all the blades are held in the device, and the only thing awkward to store is the part that stakes into the veggie (I just toss it in the drawer). The interchangeable blades are very user-friendly (even for a klutz like me) and it's easy to wash and let drip dry. Because there are so many blades and adjustable dials for thickness, I have been having fun trying new recipes that use vegetables in lieu of pasta noodles. I have already made zucchini lasagna roll ups, vegetable chips, the ever-popular "zoodles," and I've even sliced apples without coring them to dehydrate in my oven. I've also made onion noodles for a stir fry. I absolutely love this slicer! It has been used every single day since purchase. 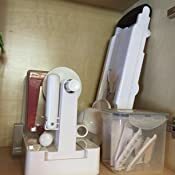 I love the locking safety feature on it, the fact that it holds itself up, so I can keep my hands focused on slicing and not coordinating so much, and that I can pop in the different blades in a matter of seconds. 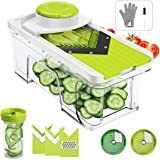 I highly recommend this if you are trying to find healthier ways to eat because using this to slice cucumbers, zucchini, onions, sweet potatoes, apples, etc., make making your own healthy meals and snacks a heck of a lot cheaper and easier! My hubs and I have been trying to lose weight and eat more paleo-style foods (no processed foods) just for the general sake of being healthy and I can honestly say that this thing has helped me lose weight because it's fun to use and I find healthy recipes when you just search for "mandoline recipes" on Pinterest or in Google. 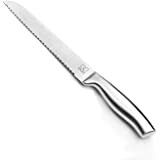 Also, the blades are extremely sharp, so you don't have to force your food across it to get thin or thick cuts. I've even sliced Yuca on it (which is a hard vegetable) and it came out great! I'd buy this, again, if I ever broke this somehow. 4.0 out of 5 starsWith a few modifications (blade storage box, cut-resistant gloves) this might just do the trick! Carrot stains not dealbreaker. 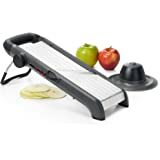 Bought this mandoline because I like the OXO Good Grips 3-Blade Tabletop Spiralizer with StrongHold Suction so much. 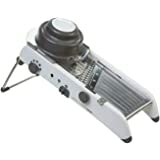 In comparing the tools I can see that OXO design has evolved since this mandoline was introduced in 2008 (search for "chowhound oxo mandoline video"). 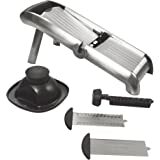 I do realize OXO has released a few new mandolines since then, but I wanted one with a v-blade, julienne cutters, a ripple cut, and a food pusher that is not spring-loaded, so I purchased this older one. 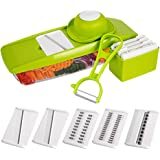 I like that the Spiralizer has a separate box with drain holes in the bottom to store the blades; there is less opportunity to cut myself while the blades are drip-drying inside the box on my drying rack and it keeps them clean and safe when not in use. 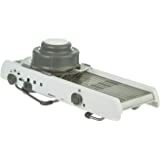 Other reviewers have complained that mandoline juice gets onto the blades stored onboard underneath this mandoline. 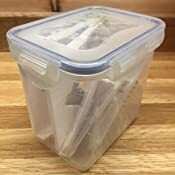 So to simplify storage and cleanup I made myself a box for the blades (see attached photos). 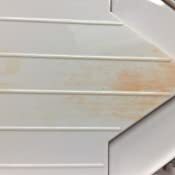 Like other reviewers I've discovered that carrots stain the runway; after grating only two carrots and washing immediately afterwards with Dr. Bronner's Pure-Castile Liquid Soap (8 oz, Peppermint), there was a permanent orange stain. This surprised me as Dr. Bronner's soap usually removes almost everything, and I washed the mandoline immediately. I don't really mind how it looks since it doesn't affect function, but if that were important to me, I could imagine being upset. I've cut oranges (thick) and onions (thin) so far. The food pusher worked just fine. The blade cut just fine. I've successfully minced onions using the "rotate 90 degrees on each cut" method, using the large (orange) julienne cutter in combination with the blue (3mm) setting on the v-blade. I've sliced mushrooms (those work best stem-side down toward the blade to get cut first). I've sliced ginger and garlic pretty cleanly on the 1.5mm setting. The food pusher does have some problems grabbing individual garlic cloves when they're mostly cut and only a little is left. I've tried julienning garlic into matchsticks with inconsistent results. I've tried waffle-cutting garlic cloves with inconsistent results. I haven't tried waffle-cutting anything else; I'm waiting for the chain mail glove to arrive so I can try it on carrots (I'd like to be able to make waffle-cut carrot "chips" for dips and not buy the yucky pre-cut ones in the store). 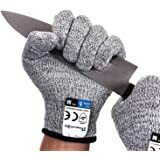 I bought a cut-resistant pair of gloves NoCry Cut Resistant Gloves - High Performance Level 5 Protection, Food Grade. Size Small, Free Ebook Included! so that I could cut things that don't fit inside the food pusher. 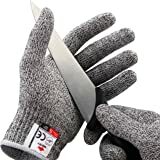 Unfortunately the tip of the glove caught in the blade as I was slicing the first onion, so in the end I returned them and bought the chain mail glove instead. 5.0 out of 5 starsNot necessary to dissasmble blades to clean after use. Since some people didn’t like the dissasembly for cleaning, I thought I would post here that I don’t think disassembling the parts is necessary when cleaning. 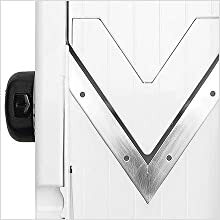 I just leave everything in place, other maybe the blade I am using though I don’t know if it really needs to be removed either. 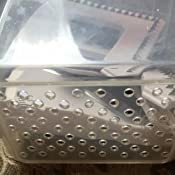 If you look closely you can see they have designed the piece with drainage holes where each blade is snapped in underneath, so the piece can be cleaned and rinsed without removing the many blades. Which makes it a super fast cleanup. 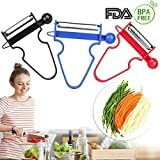 My husband and I wanted to make Chinese Shredded Potatoes with Chili and Vinegar, we needed the right tool to shred potatoes, so we looked on Amazon and found this one. OXO also sells a stainless steel model, although it's more expensive, so we just picked this one. The housing is plastic, and the blades are stainless steel, should be pretty durable. 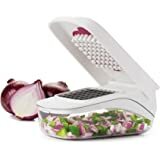 It's easy to install and use, we tried to shred onion, lemon (even the seeds!) and mango, it did a good job! Can't wait to cook my Chinese shredded potatoes!